Hamilton is the best place for anyone to ride a bike. 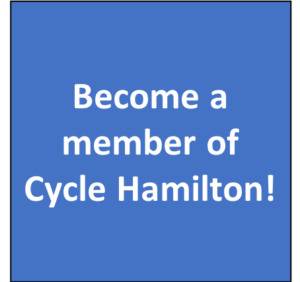 To make Hamilton a city where people of all ages and abilities safely get around by bike to all parts of the city. We strive to inspire people to ride their bikes in a growing network of connected and safe bike lanes throughout the city and to create a culture of bike riding in Hamilton. Increasing the Percentage of Trips by Bike (modal shift): Encourage the City of Hamilton to implement plans that will motivate people to ride their bikes more. Develop a set of targets to measure ridership based on different types of bicycle trips (e.g. for fun, to get to work or to school, to visit friends, or to run errands) in order to track changes over time. Action 1.1: Advocate for the City to set a target for the number of bike trips made. Action 1.1.1 – Identify a measure of success for adoption of bike routes. Action 1.2: Develop a list of different kinds of bike trips that will be important to measure and track over time. Action 1.3: Continually measure the number of different kinds of bike trips to see if progress is being made, and to understand what’s working and what’s not. Increase Number of Protected Bike Lanes: Work with residents and community partners to develop a plan for a connected network of safe bike lanes and supporting infrastructure throughout the city, guided by the best practices and examples from other cities in Ontario or Canada. This will include addressing safety gaps on routes that already have some protected bike lanes and identifying routes that still need protected bike lanes. Action 2.1: Advocate for the City to prioritize the rapid implementation of an interconnected network of protected cycling routes that will safely connect people to communities, business areas, and recreation areas across the city. Action 2.2: Advocate for the City to increase the budget to support cycling infrastructure. Action 2.3: Advocate for the City to proactively secure provincial and federal funding for cycling. Action 2.4: Advocate for the City to remove councillor veto (the ability of a councillor to reject a proposed cycling project in their ward) from the Cycling Master Plan. Action 2.5: Advocate for the City to add routine accommodation (the practice of accommodating cyclists and pedestrians in all transportation projects) to the Cycling Master Plan. Action 3.1: Develop and deliver a toolkit to encourage communities and neighbourhoods across the city to discuss what changes would be needed in their neighbourhood for everyone to feel safe riding a bike. Action 3.2: Provide opportunities for community members and political leaders to ride a bike in order to lead by example. Action 3.3: Hold fun events, such as workshops and group rides. Interested in supporting this work? Join us and become a member! !